Comments Off on Winter-Forage Small Grains to Boost Feed Supply: Not Just a Cover Crop Anymore! 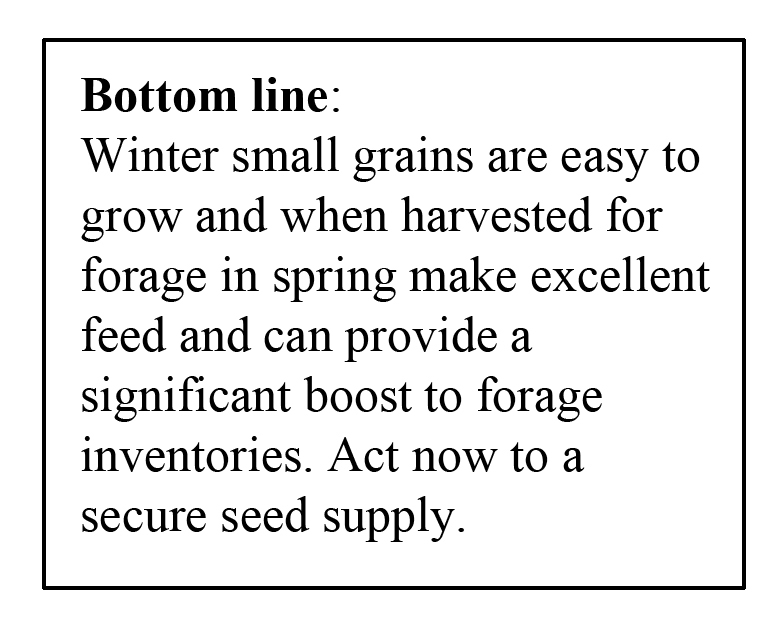 Winter-Forage Small Grains to Boost Feed Supply: Not Just a Cover Crop Anymore! Many NY dairies will need to rebuild forage inventory going in to 2013. Some farms are starting to take advantage of winter grains for spring harvest before corn planting. Properly managed, these crops can supply 2-4 tons of dry matter per acre (table 1), and in some fields in 2012 we measured up to 5 tons of dry matter of high quality forage from small grains planted after corn silage, even with little growth in the fall. Table 1: Biomass fall and spring for winter cereals seeded in fall 2011 at locations across New York State. Since these are not side by side comparisons in the same field, the averages illustrate yield ranges and should not be compared directly to each other. Crop: The main options are winter wheat, cereal rye or winter triticale. In 2011, we measured yields on all three species in a trial at the Valatie Research Farm in eastern NY and the results were very similar (2.31, 1.92, and 1.96 tons DM/acre for rye, triticale and wheat, respectively, sampled at optimal harvest time for forage. The data for 2012 are shown in Table 2. Triticale yielded between rye (highest biomass) and wheat (lowest biomass) consistently in both years. Triticale is very resistant to lodging when harvested for forage and has the best nutrition profile of the three crops. Figure 1: A late planted crop can still generate high quality and high yielding forage in the spring. 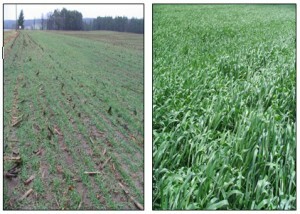 The pictures show triticale at one of the western NY sites in fall of 2011 (left; 0.2 tons DM/acre December 14, 2011) and at harvest time (right; 2.0 tons DM/acre May 11, 2012). Winter grains are very well suited to no-till and will do nicely with a coat of manure after corn silage. Planting with a grain drill or air seeder is the best option to assure a good stand and to maximize value from certified seed. The crop should be planted as soon after corn silage as possible, ideally, mid-late September. The comparison at the Valatie Research Farm suggest that earlier planting produces significantly higher biomass in the fall followed by high forage yields in the spring. However, all cereals produced more than 2.5 tons/acre DM (more than 7 tons/acre silage equivalent) even when seeded in October and with very little fall biomass production (Table 2). The later the planting the more critical the seed be placed 1 – 1.5 inches deep to prevent spring heaving from decimating the stand. Table 2: Yield for fall seeded winter cereals grown as cover/double crop at the Valatie Research Farm. Seeding took place 10/5/2012 or 9/16/2012. The above ground biomass was harvested 5/2/2012. Fields with a manure history and a coat of manure applied after corn silage before, with, or shortly after planting will not need any starter fertilizer in most circumstances. For optimum yield, the crop could need some available N (supplied by fertilizer – e.g. UAN or urea) when dormancy breaks in the spring. We have seen applications in the range of 50-100 pounds of actual N work well. We will be doing more testing to hone in on a spring N guideline and invite farmers to participate in on-farm trials in the spring of 2013 to determine how much fertilizer N is needed for optimal economic yield. Flag leaf stage supports very high milk production with good yields. More biomass will be added through early head emergence, so harvest timing will depend on farm goals and weather conditions. 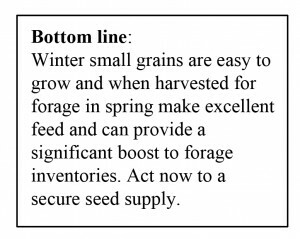 Winter small grains are easy to grow and when harvested for forage in spring make excellent feed and can provide a significant boost to forage inventories. Act now to a secure seed supply.